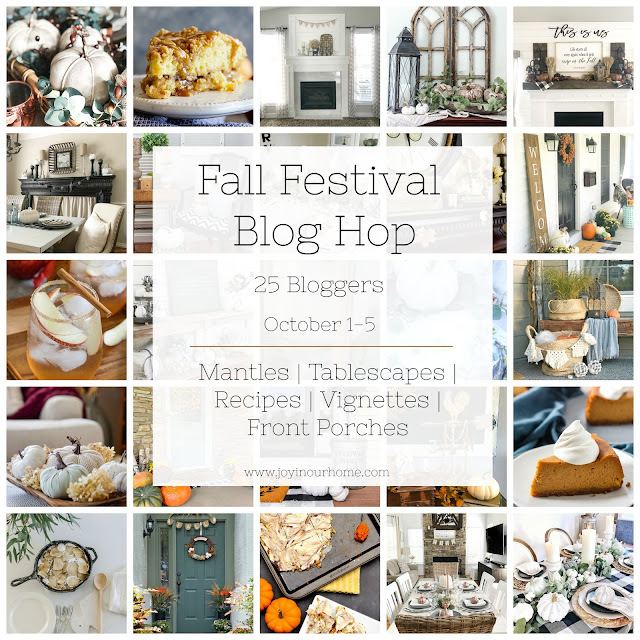 Welcome to the 🍂Fall Festival Blog Hop🍂! I'm so excited to be joining this amazing group of 25 other talented ladies featuring a different theme each day this week! Be sure to check out the others at the end of my post! Not going to lie, I was really nervous choosing to share our front door for this blog hop! Our house needs painting, it's a REALLY small space and the ground never dries out from rain right now. Our entrance isn't covered so, it's hard to put anything out front so, it posses TWO hard challenges! I was up for this challenge though because not all of us have big front porches with beautiful decks. That shouldn't hold us back from creating an inviting home! 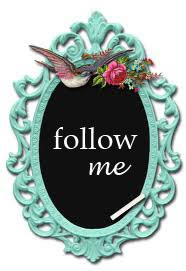 Affiliate links for product sources are included for your shopping convenience. Find Something Tall & Skinny. 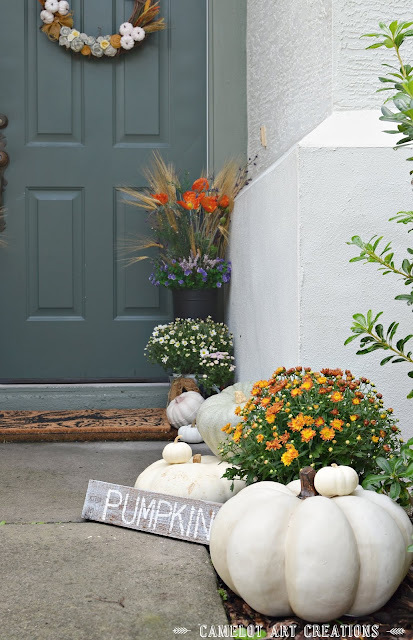 I started by gathering up some of my "not so favorite" small faux pumpkins for around either side of the door. I purchased those two tall skinny black metal flower holders from Target on clearance for $5 each several months back! They are perfect for our small entryway, taking up about 8-10 inches wide. 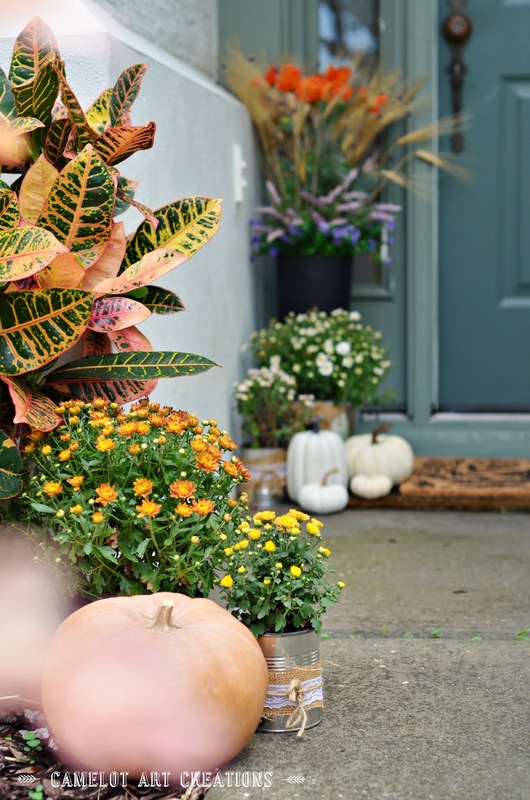 As much as I love apple baskets filled with Mums, they are just too large for our porch. Make Signs, Wreaths or a Banner. 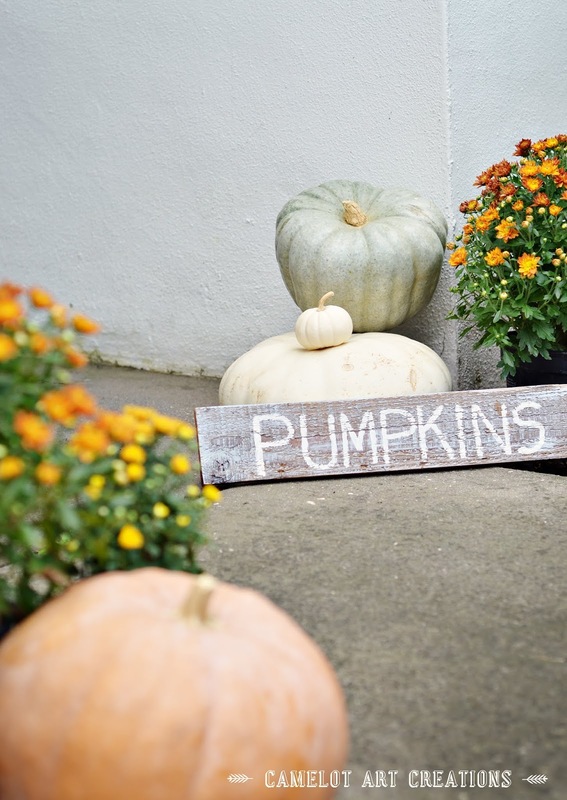 I used a piece of chalk to write out PUMPKINS on a piece of scrap wood and painted over it for a homemade sign. I made the wreath a couple year ago and you can find it HERE. 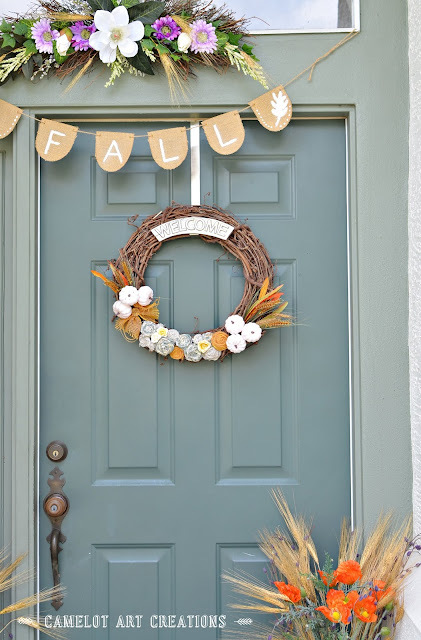 The banner is from Target Dollar Spot for $3 and I just painted FALL on it with some leaves on the ends. I like to use old soup cans and wrap them in burlap for flower pots. I had some galvanized buckets from Goodwill that I found for .99 cents and they were fill in my pantry holding snacks. 🤣 I but 2"x4" under the pots to give them a little height. 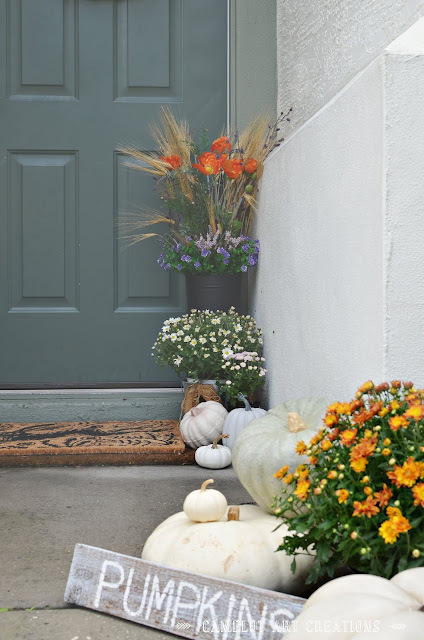 Hope this helps give you some ideas if you're working with a small entryway too! Be sure to go visit the other bloggers listed under here for more Fall inspiration! Oh goodness, I LOVE your door colours! 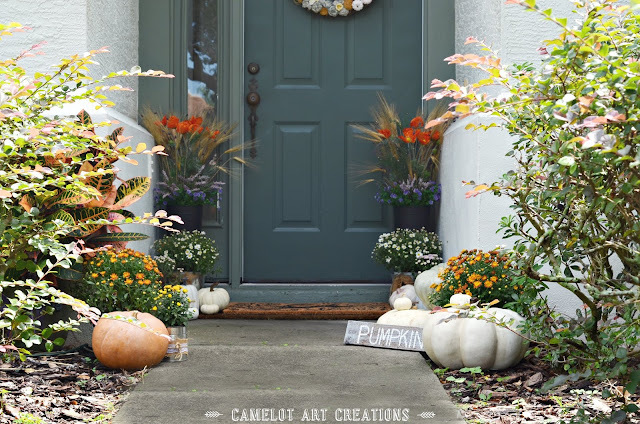 And everything just looks so welcoming all decked out for Fall! Desiree your front porch is just perfect! 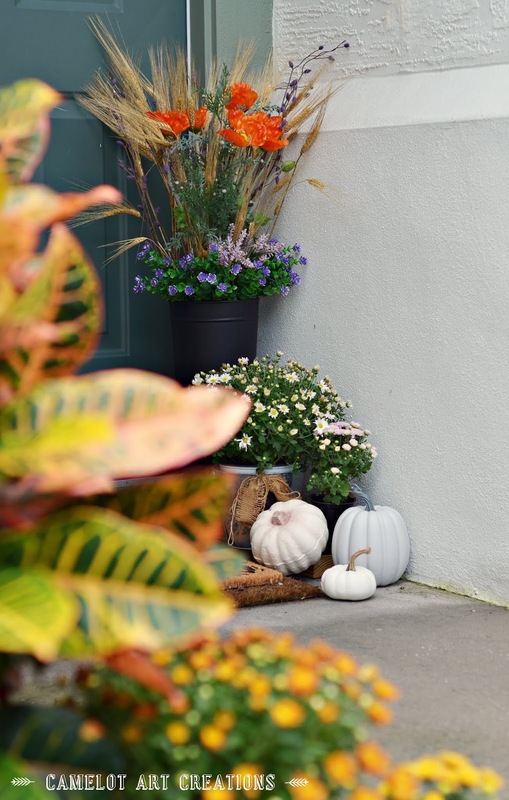 I love the unexpected planters and pops of color! 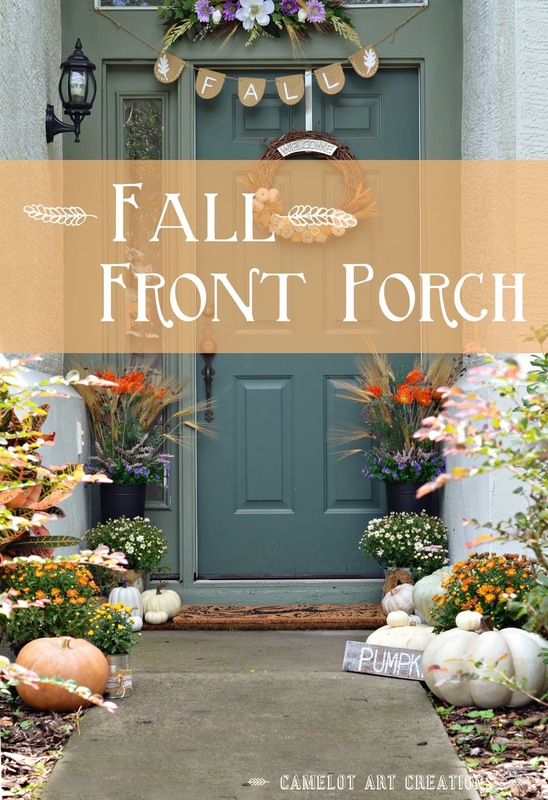 This porch is fall heaven! Those mums are gorgeous! 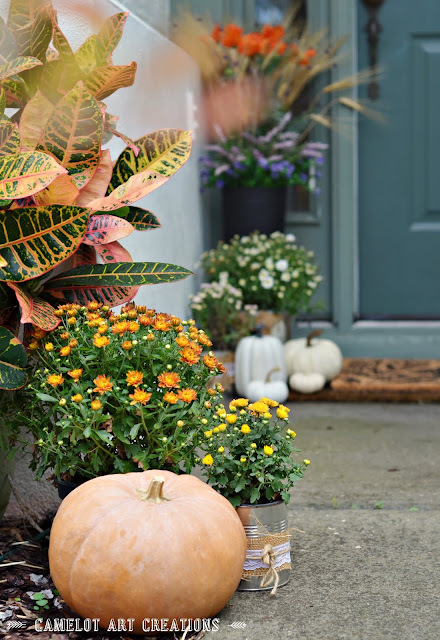 So happy to join you on this fun fall blog hop! I love what you did here! Super simple and easy for anyone to do! Great job!! 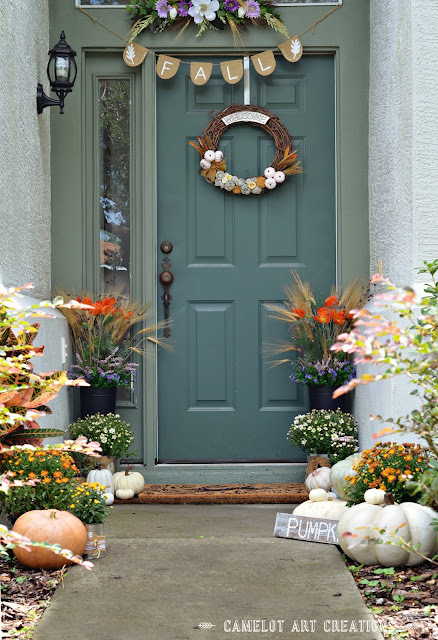 Hi Desiree, your entry looks super cozy for fall! You did a wonderful job of choosing items that can get wet. This is a great example of how you don;t need to have a large entry space to make it look amazing. Happy Fall! Well I'd have a big ol' smile on my face walking up to your porch. It's so warm and inviting! Love all that color! I agree with Cindy - I'd have a big smile walking up to your porch too! It is super inviting! I love everything about it, but I especially love the orange scarlets mixed in with the other foliage in the pots by your door is a unique touch that really sets everything off! So happy to be hopping with you this week! So pretty! 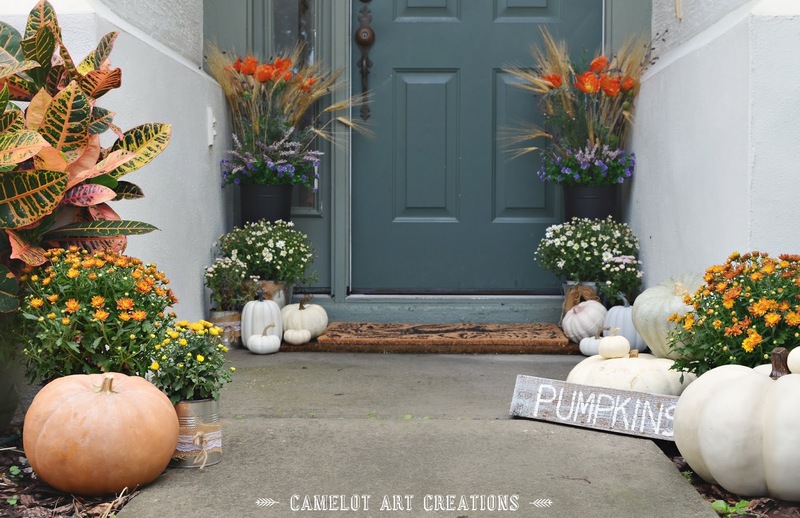 I love all the pumpkins, and mums and the foliage on the sides is so pretty! It is very inviting! Our last home had an exposed front door and I always struggled to decorate it bc inevitable, everything got wet! You did a great job and I love all the handmade touches! 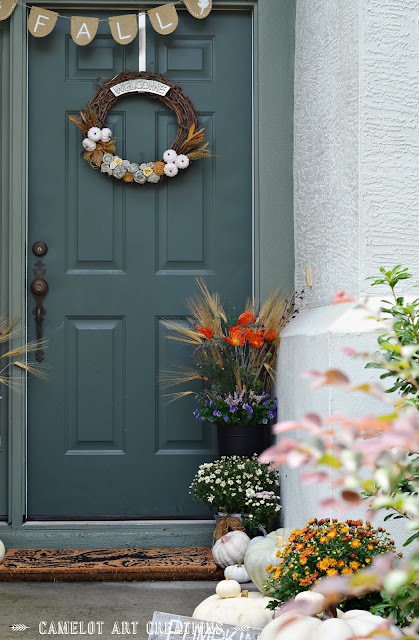 I love the color of your door and all of your fall touches are perfect! It was fun touring with you this week! Your door color is stunning and so is your fall décor, Desiree! So happy you're on this blog hop this week!